ScoobyV1.6 Platform for Testing SMIA Sensors - Atra Vision Inc. 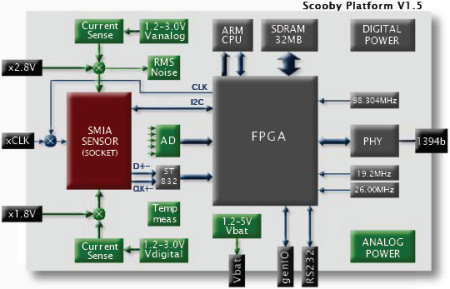 The ScoobyV1.6 Platform is powerful prototyping tool for evaluating performance of SMIA 1.0 compliant CMOS sensors. It is a complete Hardware-Firmware-Software package enabling designer to start application immediately. On-board Real time processing with Xilinx FPGA and ARM Risc processor. Real-Time CCP Timing measurement and error checking. Dual Programmable Voltage Power Supplies with build in active and leakage current measurements. Support for Internal or External Power Supplies. RMS noise measurement on analog power. Additional Programmable Voltage Power Supply simulating Cell-phone battery. Complete SMIA compliant CCI ( I2C ) interface with fully programmable timing parameters. Optional External IO connectors with: I2C , SPI, RS232 and general IO signals. Provided software package includes everything from 1394 Device Driver up to Display and Monitoring tools. Real-Time Image Capture via 800Mbs IEEE 1394b host interface. Provides interface to standard SMIA 16-pin DIP socket with CCP , CCI , Clock, ShutDown signals and Digital / Analog Power Supplies. High speed differential CCP interface is implemented with ST SMIA832 receiver. Power supplies, have built in multiple range current sensors, measuring active and leakage consumption in range from 1uA up to 500mA. The RMS converter measures noise component off analog power supply. The combination of local FPGA, SDRAM and high speed RISC processors provide support for extensive set of internal features. FPGA process raw CCP data stream, perform real-time extraction/verification of various video timing parameters and buffers the data in internal 32MB SDRAM buffer. 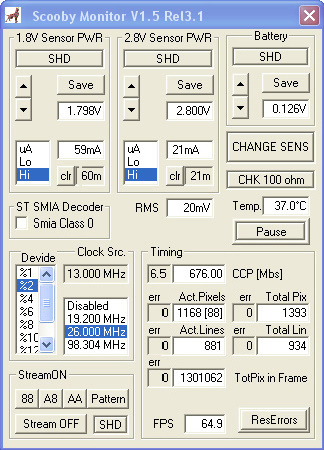 CCI interface is implemented in firmware with programmable timing features beyond SMIA spec. range in resolution of 10 ns. Captured data can be send to host PC, via high speed 1394b serial interface, either as a formated video stream or raw file data. Scooby Box is powered from 1394 cable 12 power supply . SMIA sensor powers are generate with low noise linear regulators. provides the documentation, samples, header files, libraries, and tools you need to develop custom applications. Basic functions: CCP Data capture, CCI operations, Power control are demonstrated with Visual C++ source code samples . Higher level GUI utilities: Image Display and Control Monitor are provided as a stand alone applications for fast product demonstration.